It is challenging but necessary, I think, to help students look at texts as more than just information or some new vocabulary words. To help students of lower proficiencies tackle this work, the worksheet has just been translated into Japanese by a graduate student at the University of Shizuoka, Ms. Yuiko Ito (thank you, again!). I hope this helps others try some analysis work in their language classrooms. Let me know how it goes, please! If you can suggest some changes to the Japanese translation, please let me know or just leave comments on the document. Thanks to all of those who attended our forum at JALT 2017. Some of the attendees asked for copies of the slides we used, so we are uploading them here. There was a lot of content (even though it was a 90 minute workshop), so we hope people can look through at a slower pace here. If you have any questions or comments, please leave them below in the discussion section. My students and I run a Game Club one Saturday afternoon a month at our local community center (“Jidoukan”). 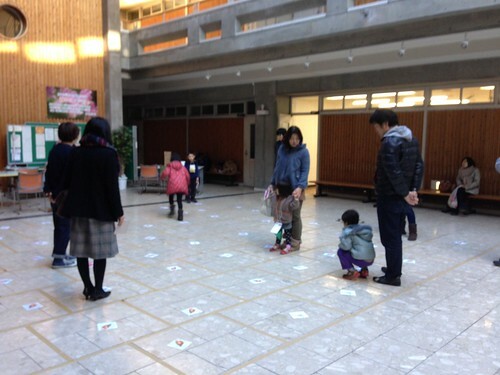 The elementary school kids learn games and make friends, and we get to experiment with different teaching activities with games. Today I had a small group (a 6th grade boy and two 3rd grade boys). The three boys chose to play with me after I and my other students had introduced what we wanted to do with the 15-20 kids that came. The older one had studied some English, and one of the 3rd graders goes to a cram school for English. I tried a new activity with them using Jenga. I spoke in Japanese to them for the instructions and main interactions. 1. They had all played the game, and they explained the rules to me in Japanese. 2. We played the game twice. 3. I asked them what they think of Jenga, and they shared their views in Japanese. We then used my dictionary to look up the main English words of their views and I helped them make complete sentences, which they repeated back to me. 4. I then showed them the rules to Jenga in English and explained some of the key terms to them (“tower, 3 blocks across, with only one hand, a loose one, take one block, put it on top”). I then asked them to change the game anyway they wanted. They suggested pulling two blocks, and not putting them on the top but on the table in front of us as points. I showed them in the rules where the related sentences were, and worked with them to change the rules (“a block” became “2 blocks,” scratching out “put it on the top of the tower.”). 5. We played our version twice. I then asked them what they thought of the new game and helped them look up translations for the main words. 6. Since we had made a new game, I asked them to make a new name for their game. They suggested “Jidoukan Jenga” which I wrote on the top of the paper. 7. We chatted about the “lesson.” They said that they thought they made fun rules, that they were happy to be able to make their own game, and that they encountered some difficult words that they didn’t know. The lesson was hard for them (one boy left halfway through to join a different table and a card game) but the general flow seemed to work. I’ve done Snakes and Ladders written rule remixing with university students and it always seems to work well and can be done in 90 minutes. I’d like to give this Jenga-based game and game language remix activity a try with some junior high school students who have had a little more grammar and vocabulary training already. It seems to be a somewhat smooth way to analyze and create games and language. Our last session of the semester. We talked about another aspect that was missing from the game: environmental impact. Players are laying track through mountains and forest and locomotives are spewing smoke, but this is not modeled in the game. If we wanted to include this in a train game, M suggested having players take an action to cut down forest / destroy some aspect of nature and then build track. This explicit action might make players think more about the effect their money-making actions took on the game world. 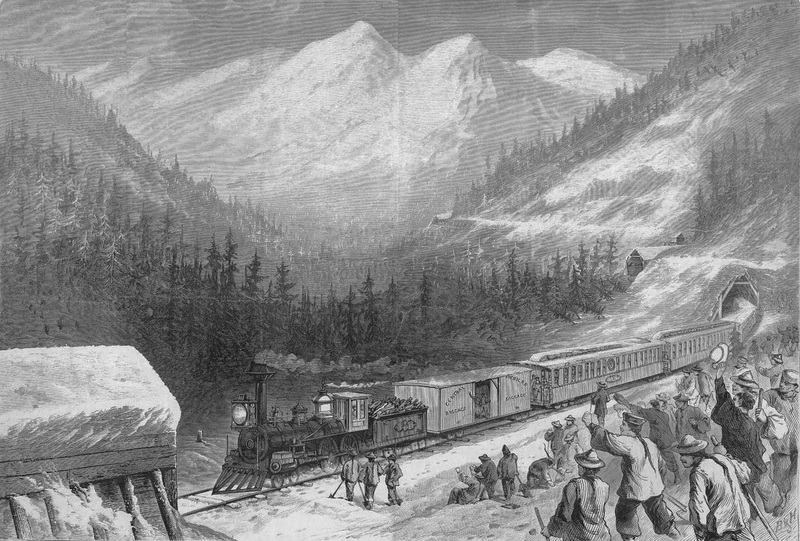 I mentioned the history of Chinese workers in the North American railroad creation, suggesting that game rules could be written to focus on tragedies related to this work. We then looked at the notes I had given them the week before on my examinations of the game rules and some attendant discourse around the game (a youtuber’s teaching and actual play of the game). They were able to look at my notes and find additional language that they hadn’t noticed before. They noticed various unknown academic and specialist (off-list) vocabulary which I used an English online dictionary and examples from the game to help them understand. Examples: flat broke, money pie, restrict, caveat, thematic, rename, tangent, signify, declare, dead broke, debt, beneficial, financial empire, cut throat, hammer, conservative, stagnation, jerk (there was a lot of crossover in their lists of unknown words). N and M both noticed patterns. M noticed that “some words are capitalized. In the case of Japanese, you can’t” and we discussed textual tools for emphasizing language (capitals, bold, exclamation marks) and how these can also be read as “yelling” in English depending on the context. M and N discussed the purposes of the rulebook and the youtube instructional and actual play videos: to teach and also to help players check if their playing is correct or not. N said that the “The video is easier to understand than the rulebook. You can look the rules” and that it would be “difficult” (and costly) to put so many images in a rulebook. About the video, M said that “combining with vocal and actual play this is more easier for me to understand. When I first read the rulebook it was difficult to imagine the actual play, so I think the video is better.” She reported liking to listen to English rather than reading English. Both of them read the rulebook for more than 45 minutes (the length of the videos) in order to check the vocabulary. This has important implications for using board games in language classrooms. Rulebooks can help the students notice new vocabulary in context, and they can be an excellent reference for particular rules and how to play the game correctly, but it they take time to read and students do not always understand how to play based on lengthy rulebooks. “Learn to play” and “actual play” videos can show students how to actually make moves in the game and have the language from the rulebook put into use. Re-brainstorm and hypothesize about language to use. Repeat until the game and language use are at a satisfactory level for both students and teacher. I am sure James can say more about this cycle as it seems it is related to task-based language teaching. She hadn’t known the word before playing the game but learned and was able to find success using it in a testing context! “Expandable” game (written on the cover of the box and rulebook). M thought it referred to expanding territory, not game expansions, so I showed them some board game expansions (e.g., Sid Meier’s Civilization) and expansions being additional nations or maps that companies can sell. The frequent usage of “him” in the core rules and some instances of “she” in the USA rulebook. M said that is is “not so big a problem. I don’t care. But, when the rule is written in Japanese, and I read “kare” I feel strange. Perhaps this is some difference between perception of gender markers in the native and second language? N said “I think it’s ok if I can understand which player is “he” (Bill, Mark in rules). If there is too many he, I don’t know if he is first player or second player” and that she would prefer Player 1, Player 2…. They didn’t read the information about trains in the rulebook. M said “she didn’t have enough time” and N “thought it was not necessary.” I mentioned that we make a game about Shizuoka and include some information in the rules, people might not read that information. I offered to do these assignments with them over the summer, if they liked. I collected all their materials to scan and then analyze for the paper and thanked them for their great work this semester. It has been an incredibly meaningful project for me! 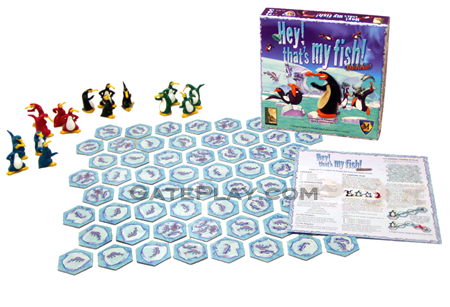 We ended by playing 2 quick games of Hey That’s My Fish (a cutthroat abstract strategy game). and I showed them a “big game” version of the game that my students created 2 years ago for a game charity event (as an additional example of a remixing / participation activity around games). I’m looking forward to continuing the Game Terakoya in the fall semester! Before starting the game, we quickly re-examined the various English structures for describing or announcing actions in a board game. I presented them with the list of structures we had brainstormed and asked them which they had heard, which were appropriate, and which ones they thought they would use in the game. They disagreed on the appropriateness of “I am going to VERB” and neither of them had heard “I am going to go ahead and VERB” (though N had heard it used with “You are going to go ahead and VERB”). I asked them to think about which one(s) to use when they announced their actions in the game that day. We continued the Eastern United States game (it took about 50 more minutes to finish, so about 2.5 hours in total). We learned that N had lived in 2 cities shown on the map (Mobile and New Jersey). After the game, we reviewed the forms and their usage of them. M thought that she used “I take” or ” I want to take instead of “I am going to take” because that form is “long” and she wanted to “play quickly.” N, however, said that she thought that she used “I am going to take” because it was “familiar” to her. I told them that I will ask them to transcribe the game and tally how many times they used each form, and the reason for each (to Examine and Conceptualize the language in the game). M: I was thinking to build the Western Link, but I gave it the idea. J: Gave up the idea? I plan on using this format of discussions in the Game Terakoya and classes going forward, rather than just springing a chat on them. (However, with more talkative students, the planning stage might not be as necessary or useful). We also discussed the game’s “usefulness” for studying English. N actually did not look up a word on her role card (“consecutive”) because she did not want to give away her secret goal. She said that she could somewhat understand the meaning of this new word from context. They said they had studied the grammatical forms for announcing actions in junior high school. N reported learning many words like consecutive and urbanize. In this discussion, I was able to raise some issues that were more challenging for them. For example, I showed them how the game was primarily an economic game (spending money to build tracks and trains to deliver goods to make money, and on and on; it is a game about consuming goods). I asked them if some other aspects of human culture, other than consuming, were missing from the game (from Buckingham’s Media Education questions). This was very hard for them to answer (M: “that is a hard question. I don’t know how to answer.”). I tried to re-center the discussion by asking them about their own lives: “what do you do other than consume?” but they still had a hard time answering. I linked back to our discussions of social impact games that focus on health, happiness, or social messages, and I also showed them how travelers in the board game Tokaido can relax in a hot spring or take in a nice view to earn points. I didn’t want to push the topic too much, but I did want to draw their attention to this subject. We talked about how games can represent reality, and if they make a game about Japan, what is included in the game and what is left out can communicate about what Japan is. I was a little surprised how difficult is question was for them, but, that means that there is a need or opportunity to do more critical and sociocultural thinking around games with them. Our discussion lasted for almost 60 minutes. We discussed 12 main questions. At the end of this longer session, I gave them my notes from the youtube videos and rulebooks and asked them to note interesting words, common patterns, and their personal impression of the texts for homework. At the end of the session, I found out that some of M’s friends are interested in the Game Terakoya project, so of course I told her and also N to invite anyone to play some games this summer or anytime. We have moved on to the “Eastern United States” map for Railways of the World. A shot of the game in progress. So enjoyable to look at while playing. We couldn’t finish the game in one 90 minute period. We noticed that each of the cities has a small illustration of a city hall, church, factory or other image in the middle of the hex. Both M and N commented how big the map was. I will take the bond. I want to take the bond. I am taking the bond. I am going to take the bond. But didn’t get into deciding which and why was right. I wanted to take more time on this. Brainstorming the language to be used in the game seems to connect nicely with the multiliteracies step of “conceptualization” and the Sykes and Reinhardt EEE model step of “examine.” Both of these frameworks want students to collect and notice language and make and test hypotheses about how language and other systems function in a media. One next step for us could be to try (“play around with”) different grammatical forms while playing the game. Another might be for students to transcribe their utterances (I video record our games) and tabulate and compare and contrast what they used in the game, and when and why. The grammar that we spent some time on is not particularly “advanced” (they probably learned most of these forms in junior high school). However, since there is variation and they volunteered this language to begin with, I think it’s worth looking into the method of student-driven analysis. Another aspect of language that I asked them about was “talking about the game” (for example: “That was a nice move” or “It looks like N is in the lead!”) not just “announcing actions during the game” (for example: “I move this cube to this city.”). I make the comparison to sports commentary. Both M and N said that they preferred to be quiet while playing. They said that they preferred to play quietly to focus on their own game, to play secretly and not to give away their knowledge of other players’ strategies. They said that “tabletalk” or “metagame discussions” (my terms here, not theirs) might come as they play more and become more familiar and gain expertise with the game (I referred them to their earlier discussion of UNO being a great game to play to just hang out; they could chat while playing the game because it’s not very hard), but they also said that Railways of the World will be setup differently each time (randomness in games…), so they still might not speak that much. Scott Nicholson’s book “Everyone Plays At The Library” has a wonderful diagram of the “board game experience” showing interactions in the game state and game world (the level M and N seem comfortable using language at right now) and interactions around external knowledge (perhaps my and M and N’s discussions about history and geography and trains) but M and N (and many students, in my experience) might not be very proficient at (or perhaps even interested in) using their second language in the social interactions around games. It’s definitely something for me to think about more. I’m playing Diplomacy (where the game really is using language well outside/about the game state) with some very high level students in 2 weeks and the game state / game world / social interaction language is so tightly interrelated. I’ll think about this more after that game. I wondered to M and N how other players play Railways of the World. We might put a poll up on boardgamegeek to ask this and other questions about the game. We are going to “pause” for the summer break in 2 weeks. I’m going to give M and N a little homework (e.g., transcribing their utterances in the videos, brainstorming some game design elements, reading some reviews). Time to start writing this project up for a paper! We have decided to dive into Railways of the World over the next couple months. It is ranked #72 on BGG overall and #50 for strategy games (very well regarded and played) and has more than 9000 owners on BGG. M wanted to play it because she thought it looked somewhat similar to the Game of Life, and N thought making tracks looked interesting/enjoyable. I’ve played it 4 or 5 times, and have really enjoyed it and also wanted to explore it more. M and N read the rules (16 pages) for homework, but really struggled with the overall flow of the game. M estimated her understanding to be at 60%, N, hers at 10%. So we started with what they understood, and I asked them questions to connect what they knew with what they didn’t, and they went through the rulebook again to find answers to what I was asking. Some recasting was done, but related to information, not language. They really don’t have major language issues. It is a well written rulebook, but of course much heavier and complex than what they are used to. I can see why some students use their L1 to play games in class. If students have just a general concept of the game (not enough specifics to play well), it’s just easier to talk in Japanese to make sure that everyone is on the same page. It is a little frustrating for both students and teacher (we wanted to play the game!) to take so much time with the rules (60 minutes today), but it’s necessary in order for the gameplay to go well, and for further analysis of the rulebook and connected sociocultural concepts discussions to go well. These are all concepts we can dig into after playing the game and reading some reviews and threads online about the game. At this point, we are thinking about designing an expansion for the game based on a Japan or Shizuoka map (meaning we’d have to research the history and geography of the rail development here). M said she had studied this topic briefly in high school, but had forgotten everything. They weren’t able to brainstorm useful language for play for today because they had such beginning comprehension of the rules. I asked them to brainstorm a bit for homework. We are meeting tomorrow from 9-12 (on a Saturday morning) to play. I’m bringing the coffee and donuts! We set up the game on a large group of desks. I asked them what they brainstormed as useful language during play. – N intended to use some new vocabulary (upgrade, locomotive, link and urbanize). We discussed these as nouns/verbs/Japanese loanwords. The game took about 2 hours to play, and went very smoothly. Players don’t start with any money in the game and have to take out loans to get cash to do anything in the game, and this concept took a little time getting used to. 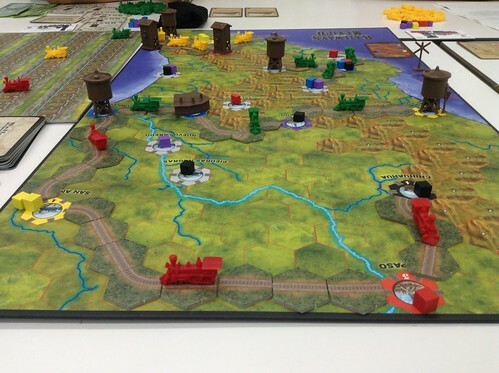 I took an early lead due to some aggressive first player auction bidding to get some powerful railroad operations cards, but N built up a very efficient network of tracks around Mexico City and was able to deliver goods every turn. M struggled with cash and loans and to build in the expensive mountains. I had the most points at the end of the game, and was able to get a Baron card bonus for having the most upgraded locomotive, but I was penalized for having too many loans and N’s Baron card gave her 10 extra points based on 5 connections out of Mexico City. N won! We discussed the game for about an hour after playing. M thought the game was fun in trying to figure out what N’s Baron card bonus was, which lead into a discussion of “public vs private information” in various games (UNO, Shogi, Poker). N also thought the game was fun because “her plans worked well.” She thought a lot about the colors of cubes and cities and was “happy” when she was able to deliver goods. I asked her to clarify was “happy” meant (like getting a present?) and she looked up the word “achievement” and we discussed the sense of achievement in games. We discussed how the geography of the board, our hidden Baron cards, and the colors of cubes and cities encouraged us each to start and develop and strategize in different locations of the board. In these discussions, both M and N make a few grammatical mistakes discussing money in English a few times (“costs much money” – “costs a lot of money”). M and N liked building tracks and looking at the board. We discussed the feeling of “ownership” over what we had created in the game. M said that even though she realized half-way through that she was going to lose, she still thought it was interesting to think about N’s and my secret Baron cards and which player was going to win. Both had some trouble choosing which tile to place (there are some with multiple tracks) but that it would go better next time. We discussed the similarities with other games giving the players money at the start of the game (e.g., the Game of Life) and how this would make the game easier for new players. We briefly discussed what changes we could make to the map/game in our Shizuoka or Japan map/game we plan to make and distribute. We discussed the plastic empty city markers (very Western objects – turn tables and roundhouses) and what objects we could use for a thematic Japanese map (department stores, rice fields). I mentioned we could 3D print some markers…. We discussed having to study geography and history to build our map. We will be meeting next week to try the other map in the box: The Eastern United States (M’s choice). We briefly looked at the map and looked at the proximity of cities in the Northeast. I asked them to read the “strategy section” of that rulebook for homework to prepare. Note: This post describes a 2007-2009 project. Video and computer games are receiving increasing attention by educational researchers and practitioners; however, most of the theory and pedagogy focus on general education (e.g., Squire, 2006) or language and literacy development of native speakers (e.g., Gee, 2007). While investigations have been made of second language learning in multiplayer games (Piirainen-Marsh & Tainio, 2009; Sykes, Oskoz & Thorne, 2008; Zheng, Young, Brewer & Wagner, 2009), there are very few examples of classroom or community uses of games to support second language development (e.g., Yip & Kwan, 2006). 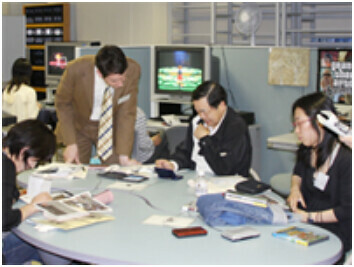 While language learners enjoy games, and some game features can facilitate learning or practicing a second language (deHaan, 2005a), experimental comparisons of games to other media as well as case studies of game players have resulted in mixed learning outcomes (deHaan 2005b; deHaan 2008; Fujii, 2010). 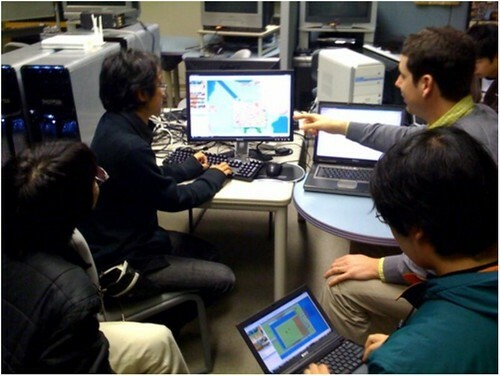 To investigate experiential aspects of games and language learning, a Video Game Library was created and administered for two years at a rural Japanese University. 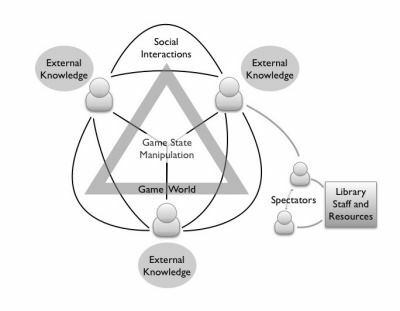 The design of the Library and its instructional programs were influenced by epistemic gaming (Schaffer, 2006), constructionist learning with games (Kafai, 2006), and gaming in libraries (Nicholson, 2010). 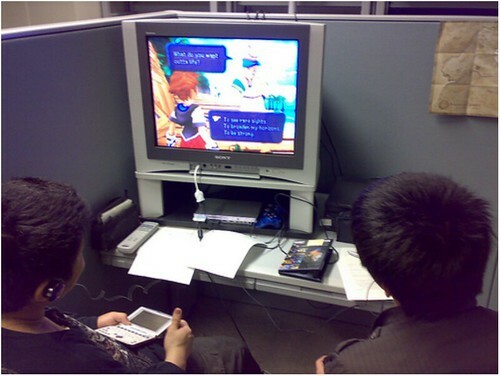 The Library was open to all students between 20 to 30 hours per week, and contained multiple PlayStation 2, PlayStation 3, Nintendo Wii, Nintendo DS, Nintendo Game Cube and Windows computer systems. More than 100 commercial-off-the-shelf English language games were available for student use. Students played individually and in small groups, and used dictionaries, Internet guides and forums, game diaries, vocabulary sheets, and the researcher to understand and reflect on the games’ English. Data sources included video recordings, fieldnotes, interviews, participant play, questionnaires, player projects, diaries and worksheets. 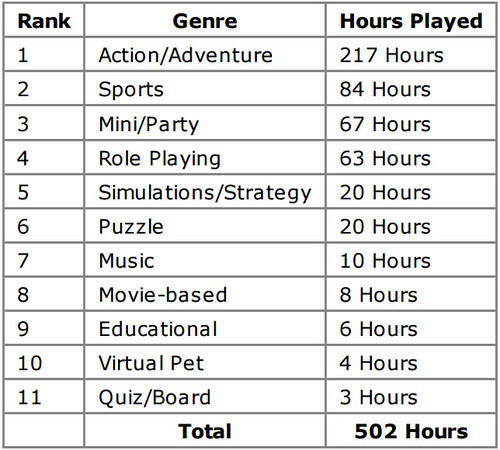 In total, more than 500 hours of games were played in the Library by more than 200 individuals. 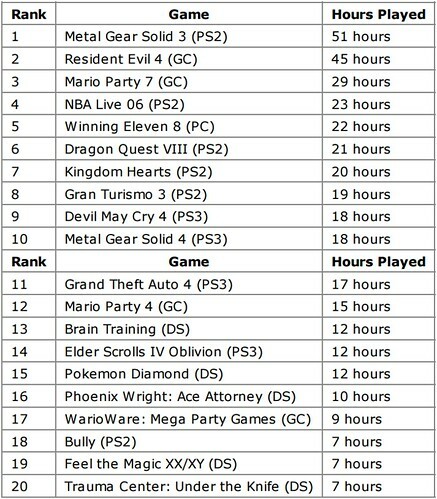 Time was logged independent of how many people played or watched a particular game; it was calculated based on how long each game was checked out of the collection. Students needed to use their English skills to play most of the games; they had to carefully read and comprehend English used in game menus (“Do you want to proceed?”), game instructions (“Avoid getting flattened by the pages! Find a hole in the falling page and position yourself so you fit through to the next page.”), and character creation choices (“What are you afraid of?” 1. Getting old. 2. Being different. 3. Being indecisive.”). However, it was possible for many players to draw on game schema or intuition to play many of the games (especially sports and adventure games) “by feel” and ignore the games’ English. These 17 short vignettes (presented alphabetically by game) illustrate various uses of English by game players in the Library. Students used English game websites, repeated game language, played games without having to read the English, used English from the games to communicate with other players, read game text carefully to make decisions, made corrections to their English through communication with a native speaker of English, and used worksheets to investigate game language. These vignettes are not representative of all experiences by players in the Library; many students played quietly by themselves and never spoke or wrote any English (these students may have learned or practiced language but these experiences are not investigated in these vignettes). PLAYER labels are specific to each game vignette. A player had been learning how to play the game for several sessions. He had gotten used to navigating the space and completing missions, but cannot complete a specific mission, seemingly because he cannot hear or read the English hints. He is quite frustrated. I suggest that he use an FAQ/walkthrough to complete the mission. He is interested in this and pauses his game, so I show him how to find the Bully walkthrough at www.gamefaqs.com and search for the mission using a keyword from the mission: “chocolate.” He spends a few minutes reading the online text, then goes back his game, unpauses it and immediately completes the mission. Four friends are playing this game for the second time this week. The first play session seemed very frustrating for them – they could not solve any of the sentence puzzles. One of the friends has gone to a FAQ site and printed the walkthrough for the puzzle they were stuck on. The friends easily finish the puzzle, but do not read any of the sentences; they just read the FAQ and then select the correct answer for each question. PLAYER1 is playing a mission in which he has to pick up girls around town and bring them to a police party. He skipped the instructions for the mission and soon after he started playing says out loud in Japanese “I don’t understand what I need to do.” His friend, PLAYER2, has been playing another game, but hearing this, turns around, and after studying the screen (especially the mini map) for several seconds, tells him in Japanese to pick up a girl and bring her to the party. PLAYER1 does this and on his second try completes the mission. I talk with PLAYER2 when he finishes playing his game. He has not played GTAIII before, and when I ask him how he knew how to finish the mission, he responds in English “Green dots people…pink dots place.” He did not have to read the English instructions to be able to teach someone else how to play the game. Four friends are playing a collection of microphone minigames together. The game instructions tell them the controls to speak into the microphone, e.g. “Rocket Punch,” “Double Punch” and “Rotate.” The players are able to speak these words into the microphone and successfully control their characters. 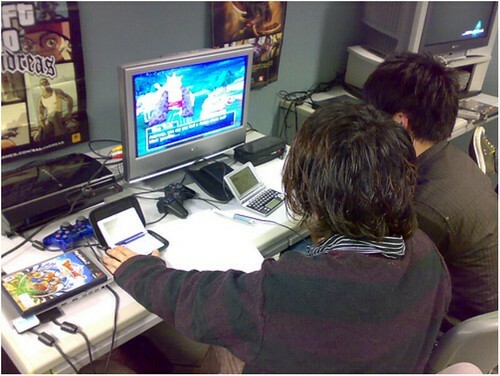 PLAYER1 begins to rehearse the English words and phrases before his turns, and the other players, noticing his success in the games, also start rehearsing the English phrases before their turns. Metal Gear Solid 3 – FAQ Two friends played Metal Gear Solid 3 for several weeks together in the Library. PLAYER1 always controlled the game and PLAYER2 looked up new words in his electronic dictionary (e.g., “proceed” and “ration”) and gave translations out loud and took notes on game diary sheets. PLAYER2 sometimes mimics game dialog, for example “I see him!” At one point the players could not figure out how to enter a military complex. I suggested that they use an FAQ/walkthrough to complete the mission. I showed them how to find the Metal Gear Solid 3 walkthrough at www.gamefaqs.com and search for the mission. PLAYER2 spends a few minutes reading the online text, then tells PLAYER1, in Japanese, exactly where to enter the complex, PLAYER1 enters the complex, and they continue playing together. PLAYER1 spends a lot of time in the Library and talks to me about English movies, music (e.g., “What does ‘All you need is love’ mean?”) and his homework. He regularly challenges me to play basketball with him, taunting me with “Come on!” We always make a big deal of trash talking before and during our games (in English). In one game, he hits a difficult shot and praises himself with “nice shoot” to which I respond “nice shot.” A few minutes later in the game he uses “nice shot” correctly. PLAYER1 later teaches a friend how to play the game and has the friend play the game by himself while coaching from the side. From time to time he compliments his friend with “nice block” and “nice play.” PLAYER1 plays basketball on a University club, and once told me that he learned and successfully implemented a basketball play he learned from NBA Live 06 in a game in the gym. PLAYER1 has played many games in this series, and plays the game very well. He shoots, attacks and navigates barriers with ease. He does not watch any cut scenes – he skips them. He does not read any text about items – he quickly presses the “A” button to grab them. He may be showing off for his friends who are watching. At one point the screen displays an item in the game world and a textual command “A = Take.” One friend, PLAYER2, translates “take” into Japanese. PLAYER1 does not comment. A few minutes later, PLAYER1 has escaped a falling rock and needs to kill some enemies. He moves around the screen quickly. Some ammunition appears on the ground but PLAYER1 does not pick it up. PLAYER2 begins to point at the ammunition on screen and yells excitedly at PLAYER1, in English, “Take! Take!” PLAYER1 moves over to the ammunition and takes it. The player takes a long time to read the various instructions about missions and upgrading abilities. The game has a narrator that guides the player through the tutorial, but he turns the volume of the television off. He mouths some of the words of the on-screen text. He nods his head in understanding after reading several text boxes. I ask him “Are you reading the text?” and he replies “Yes.” I ask “Do you understand” and he replies “OK.” In the next mission, he has to rescue a person hanging from a building ledge. The button to save the person is displayed on the screen. He very obviously looks at the button and explanation on the screen, then down at his controller and presses the correct button and saves the person. I sit down next to the player. He needs to carry a person to the hospital and he cannot figure out how to do it. He looks closely at the screen and notices the on-screen command. He turns to me and says in English “Hold” and then deliberately presses and holds the button to carry the person to the hospital. After the mission, he spends several minutes reading text to upgrade his abilities. Three friends are playing together. They choose their characters and names and the game asks them to confirm their choices, prompting them with “Yup” or “Nope” as choices. The friends do not know what these words mean and do not make a choice. They turn to me and ask in English “what does this mean?” I bring them three vocabulary worksheets and they work through the questions together for the word “Yup” (looking up a definition in their dictionary), choosing parts of speech, and writing their own sentences. We spend some time on the worksheet question regarding register and I explain that “Yup” is a more casual form of “Yes.” After they finish the worksheet, I ask them “Do you understand this word?” and they all respond “Yes.” They do not respond “Yup” even though they have just repeated this word dozens of times in the last five minutes. They have perhaps made a correct pragmatic choice in their language (if they thought that they should not use “Yup” with me – a professor). However, they may not feel comfortable using the new word in conversation yet. I played soccer regularly against one of my students. He spoke only in English with me. At one point in a game, he presses one button instead of another and quietly says “miss, miss.” I ask him “mistake?” He immediately responds “mistake.” The next day we are playing soccer again. He takes a shot on goal that sails high over the crossbar. He says confidently in English “mistake” and uses “mistake” and “made a mistake” instead of “miss” after controller mistakes in future game sessions. 39 students completed a total of 319 game diaries (in English) that asked them to reflect on gameplay, new vocabulary, and their opinion of a game’s usefulness for learning or practicing English. 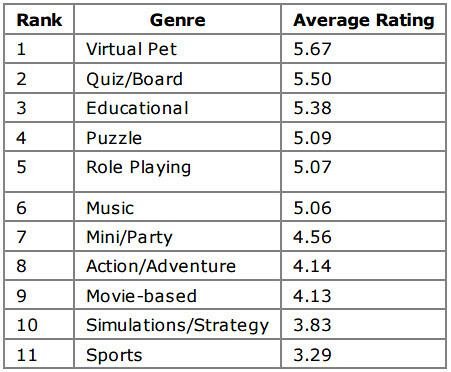 The vocabulary words (587 tokens) were analyzed using VOCABPROFILE (http://www.lextutor.ca/vp/eng/) for level of vocabulary. Most of the vocabulary the students noticed and researched were Off List words. Only 8.5% of the words were academic. Helpfulness of Game for Learning Language (Helpful Game Features). 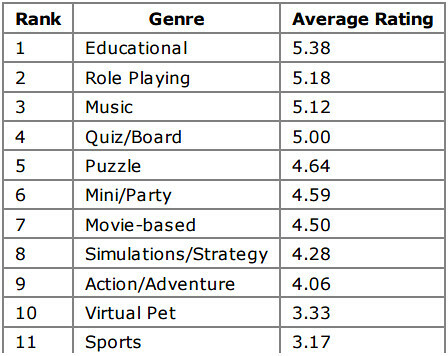 Action/Adventure and Sports games were some of the most played games in the Library, and were enjoyed, but students seemed to believe they were not especially useful or helpful for learning English. Educational games were some of the least played games in the Library, and were not enjoyed, but students seemed to believe they were useful and helpful for learning English. 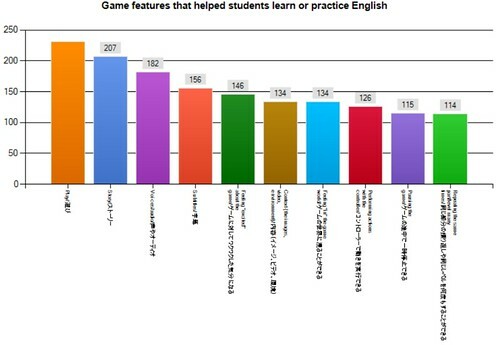 The following chart shows game features students reported to be helpful for learning or practicing English. Units on the chart represent the number of times the feature was reported as “helpful” on submitted game diaries. Students could select more than one helpful feature for each game. 16 students completed a total of 105 game vocabulary worksheets (in English) that asked them to select one new word from a played game and investigate the word’s context, applications and collocations. 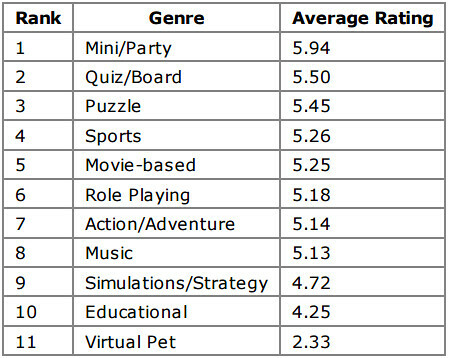 The vocabulary was analyzed using VOCABPROFILE (http://www.lextutor.ca/vp/eng/) for level of vocabulary. Most of the vocabulary the students noticed and researched were either K1 Words or Off List words. Only 14% of the words were academic. Verbs were the most popular vocabulary type noticed and researched. Interviews were conducted with 20 students regarding self study with games in the Library. Many students were positive about using games to learn English (“I learned a new way of studying English. I was studying and having fun. I was happy”) and found the game diaries and vocabulary worksheets “annoying” but “very useful – can get a complete understanding of the word.” Students believed that playing with friends (“If I don’t know words, my friend might and we can learn from each other and together”) or playing with a native speaker (“If we use Game Library, we will have a chance to talk with Prof. deHaan. Game may only improve reading or listening skills, but talking with teacher will improve speaking skills”) were the best ways to use games to learn English. A vocabulary test was constructed based on new words nine students had written on their game diaries and vocabulary worksheets. The test asked these same students to write the Japanese translations of the presented English words. On average, students could translate only three out of 20 words they had “learned” from the games they had played. I worked with three students for four months (we met five times) to design and develop English language roleplaying games on the Library PCs. These three students were friends and were very interested in careers in game design (one had a game design scholarship). They were students in one of my classes, and I offered to meet with them extracurricularly to make games and study English. We used RPG Maker VX (four licenses were purchased with research funds). I found game design articles and tools and led discussions on story and character design, and one of the students (the one with the scholarship) gave mini lectures on programming and other technical details (he created a wiki page for difficult terms and language in RPG Maker VX). We used an http://pbworks.com wiki to plan our games. Nearly all of the activities were done in English. Meeting 1: We talked about RPG genre elements (character types, leveling, themes, items, parties), discussed the stories of our favorite RPGs (we collaboratively negotiated an English summary of the main plot of Final Fantasy X), and we started writing ideas for the main plot of our own RPGs. We learned how to create maps and add objects to the map. Students’ summary of Final Fantasy X’s story: BEGINNING When Tidus is playing blitzball in Zanarkland, Sin attacks him and he is sucked into another world. MIDDLE (TURNING POINT) Many people try to kill Sin using ultimate summon spell (soul), but Tidus notices Sin is born from ultimate summon and summoner (Yuna) is dead. This is the bad cycle. END (RESOLUTION) Sin is destroyed and the world is changed by stopping bad cycle (without summoner: continental circus, an airship goes into Sin and cooperates. In fact, Sin is Tidus’ father) and Tidus is banished. Meeting 2: I used an online three-part interactive story telling game (http://www.ludomancy.com/games/StoryTeller.html) to reinforce narrative sections and language; the students experimented with the game and had to verbally explain the story they had created with the tool. We took turns presenting our own story ideas; each person said one sentence for each chapter in his game. We learned how to create events (jumping to other maps and triggering battles). Meeting 3: We refined our stories and continued working on game events (background music). Meeting 4: We used Game Faqs and Google to find game scripts from our favorite RPGs. The Persona 3 script led us to discuss formal and casual English language and who might use certain English registers. Persona 3 script student notes: student: casual conversation ex) Student: S’up, dude? How’s it goin’? teacher: formal conversation ex) Shuji Ikutsuki: Okay, everybody’s here. I’d like your undivided attention. Forum Question: Can GTA teach me English? Forum Post: Maybe, but there are lots of bad words. Student (out loud): Yatta! Meeting 5: We discussed our favorite RPG characters and read an article by a professional game developer on effective character creation (http://www.gamasutra.com/view/feature/3480/building_character_an_analysis_of_.php). The students were very focused on comprehending the article meant for other game professionals. We used the content of the article (characterization, character development, names and backgrounds) to shape the main characters in our games. Additionally, for our main character, we described how he/she would act in certain events (e.g., if he were asked for money, if she were asked on a date) using conditional sentence structures. We also discussed dialects and varieties of English to characterize game characters, and also used online baby name websites to find appropriate names for our characters (e.g., one player searched for names meaning “beautiful”). Another student found and used a Japanese website with long lists of English adjectives and translations to describe personalities. We discussed how character names in Harry Potter (e.g., “Voldemort” or “Hermione”) sounded “good” or “bad” and students reacted to each others’ created names (e.g., “Peony” and “Menth”). We spent time manipulating and creating items for our games. The students were very motivated to create games using RPG Maker VX; they often came hours before our meetings to work on their English text on the wiki or develop their games. The students were sometimes frustrated because they had “many ideas but can’t combine them.” The students were a little surprised when I asked them to use the English version of the software, but seemed to get used to the English menus and descriptions very quickly. The students pushed themselves to explain their story ideas to me in English, and the students offered (sometimes in Japanese) very constructive and detailed critiques of ideas. Writing story summaries, character descriptions, and brief dialogs provided opportunities for mini lectures on grammar (contractions, verb tenses) and vocabulary use. RPG Maker VX was easy for these students (computer science majors) to use; options for less computer literate students might be The Cartoon Network’s game creation tools (http://gamecreator.cartoonnetwork.com/), Scratch (http://scratch.mit.edu/), or even drawing “screenshots” and game systems on paper. I worked with eight students for four months on the creation of an issue of a print and online English game magazine. We met as part of a University-wide seminar series supported by extra credit and funding for each student. All of the students were taking or had taken one of my University English classes, all had played games in the Library, and some belonged to a University game creation club. Many students had been friends before the seminar. The students elected to take the seminar, and there was no limit on the number of students I would have accepted. We used Open Office to layout our magazine and an http://pbworks.com wiki to plan our articles. Nearly all of the activities were done in English. Meeting 1: We discussed goals and steps of the seminar (creating and distributing an English language game magazine) and looked at numerous examples of print and online game magazines (e.g., Play, Edge, EGM, Famitsu, Game Informer, 1up.com, gamespot.com) and made and ranked a list of important game magazine elements (e.g., title page, game reviews). Meeting 2: We narrowed the focus of our magazine (we decided to create a magazine introducing unique Japan-only games), selected features we wanted in our game reviews, brainstormed games to include in the magazine, and selected a high-quality color printer to purchase with our budget. Meeting 3: We deconstructed various authentic video game reviews of Pokemon Diamond (a game all the students had played); we made notes of important topics and evaluative language to describe games. Meeting 4: We spent time writing our reviews, and I gave a short workshop on using online translation software effectively (i.e., sparingly and critically). I also gave the students some instruction about using dictionaries and thesaurus tools to develop (i.e., vary) the vocabulary in their reviews. Meeting 5: We discussed common scoring guidelines and the students added scores to the sections of their reviews. Meeting 6: We downloaded and installed Open Office (free word processing software) on each computer. We used whiteboards then Open Office table formatting to discuss various layouts for our reviews. Students used a variety of layouts to organize their review sections. Students sent their reviews to me to edit after they finished. I gave them feedback about language choices and asked them questions to guide their writing (especially if something was unclear or ignored in their review). Meeting 7: We brainstormed titles and layouts for the cover page, table of contents and member and information pages of the magazine. This was an extensive process, but finally all members seemed to agree on fonts, colors, layouts and text. Each student used an online flash tool (http://www.blogcdn.com/www.joystiq.com/media/2006/10/mii.swf) to create a Mii-like caricature of themselves for the member information page. Meeting 8: This was a work day for all members to finish their reviews and layouts and work one-on-one with me. Meeting 9: We printed all the pages of the magazine and did a group and peer review process of language and page layouts to standardize the content. Meeting 10: A professional graphic designer working at the University in the Graduate School Office was invited to come to our seminar and critique each page of the magazine. The students were very nervous and excited about this process. They asked many questions about the layout, font, and colors of their pages. This activity was done in Japanese because the graphic designer spoke limited English. The students seemed very appreciative of the designer’s professional advice and made numerous changes based on her feedback. Meeting 11: The pages were consolidated into one Open Office document and a pdf file of the magazine was created and once more reviewed for any omissions or formatting changes. When all the members were satisfied with the magazine, we created an issuu.com (an online magazine reading site) account and uploaded our file for public reading. The students learned how to embed the document on their own blogs and websites, and how to monitor the reading/downloading of the magazine from issuu.com (we shared issuu.com login information). We had a small “publishing party.” The remaining seminar budget was used to pay for a printing company to make 3 bound copies of the magazine for each member. Although some of the students lost some motivation over the course of the semester (originally there were 10 members but 2 dropped out), the final weeks of designing and reviewing the magazine pages seemed very motivating to the students and all were very happy with the final results. This project created opportunities for students to develop their speaking skills (discussing games, magazine focus and design and layout issues), listening skills (having to listen carefully to other students ideas in order to respond appropriately), reading skills (reading numerous game reviews carefully to learn how to write reviews in English) and writing skills (using positive and negative critical language and describing game features). The students also developed their use of word processor, dictionary, thesaurus and translation software. I worked extensively with each student to help them write what they wanted to convey, and was able to help students use new vocabulary related to games and gameplay (e.g., “learning curve”). The students were very motivated by the professional designer’s critique of their work; they began to work much harder when her visit was announced a few weeks prior. The wiki was useful for planning magazine text and for me to give students individual feedback. However, there were not enough PCs for each student and the Play Station 3s’ web browsers and USB keyboards were used by some students to write on the project wiki. The students did not seem comfortable using these technologies (the connection seemed slow and the wiki did not display well on the screen). There were also limitations to using Open Office to layout the magazine; some students had difficulty working with tables to create their pages and also had trouble manipulating images. Working in a larger computer lab with design software such as Scribus (also open source) might be easier to manage for the instructor and students. A game magazine publication project seems well suited for an extracurricular project for students especially interested in games or critical writing. This project could be modified for other group review projects (perhaps of movies or music). Teachers working with lower level students might consider having students work in pairs (in order to focus students more on language by negotiating content). Alternative formats of the magazine might include a blog or half-page reviews (as long as students have enough space to describe and critique their selected games). This project could be scaled down to be used in project-based writing instruction (magazines could be a framework for developing students’ descriptive, summarizing, technical, and critical writing skills). If computers are not available, students could write/draw on note paper and the writing could be copied and bound for the class. 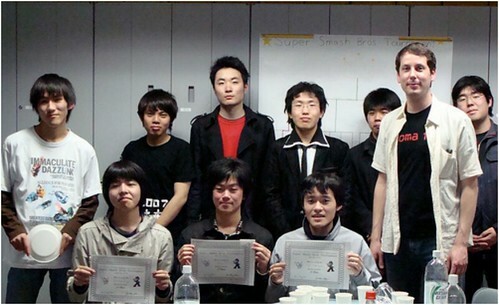 A Super Smash Bros Brawl tournament was held on a weekend to introduce all University students to the Library. 45 students participated. Tournament announcements (e.g., welcome, rules, bracketing, awards) were conducted in English. There were many instances of great sportsmanship, chatting and cheering (mainly in Japanese but sometimes in English). Small gift certificates were given to the winners. 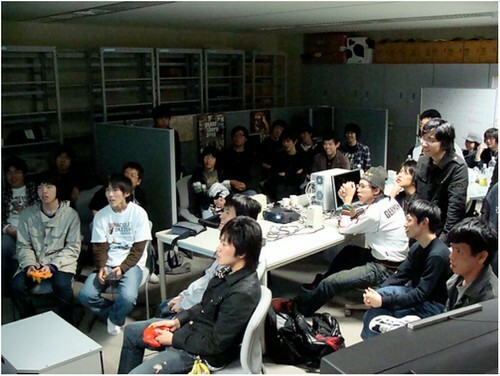 Many tournament participants visited the Library the following week to play Smash Bros and other games. Future tournaments could include formal English instruction (e.g., how to ask game-related questions) or be interspersed with other educational activities. Tournament videos are available at http://www.youtube.com/user/gamelibrary. 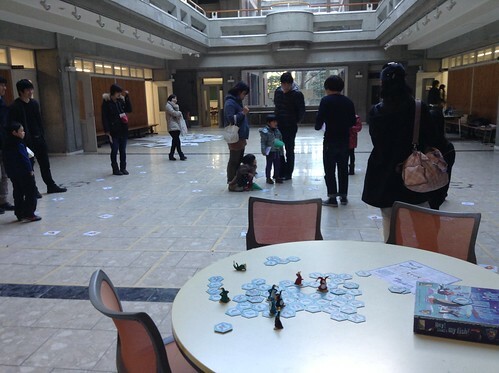 Several weekend game and English workshops were offered to families and high school students. In the workshops, participants were introduced to game genres and good games for language learning. Participants chose a Library game to play for 30 minutes (practicing listening and reading skills), completed a video game diary or vocabulary worksheet (practicing writing skills), and gave a short presentation (in English regarding gameplay and language) about the game (practicing speaking skills). Participants were also introduced to participatory ways to develop language skills (e.g., reading and writing game FAQs and using game design tools). It was difficult for some parents not familiar with games to use the PlayStation controllers. Two young children with very low English proficiencies chose difficult RPG games and had to have everything translated for them. Overall, workshop participants enjoyed the integrated language learning with games workshops. Tournaments and workshops may be effective ways to introduce communities to studying English with games. Although students enjoyed playing English games, and seemed to practice English skills while playing, the learning outcomes seem mixed and somewhat poor. Game players should practice reflective language learning with tools that require them to focus on and use the games’ English. Students practiced a variety of language and technology skills with the design projects held in the Library; projects such as these will be continued and further developed to meet students’ specific learning needs. deHaan, J. (2005b). Acquisition of Japanese as a foreign language through a baseball video game. Foreign Language Annals, 38(2), 278-282.
deHaan, J. (2008). Video games and second language acquisition: The effect of interactivity with a rhythm video game on second language vocabulary recall, cognitive load, and telepresence. Unpublished doctoral dissertation: New York University. Fujii, Y. (2010). Acquisition of English as a foreign language with an adventure puzzle video game. Unpublished graduation thesis: University of Shizuoka. Gee, J. P. (2007). Good video games and good learning: Collected essays on video games, learning and literacy (New literacies and digital epistemologies). New York: Peter Lang Publishers. Kafai, Y. B. (2006). Playing and making games for learning: Instructionist and constructionist perspectives for game studies. Games and Culture 1(1), 34-40. Nicholson, S. (2010). Everyone plays at the library: Creating great gaming experiences for all ages. Medford, NJ: Information Today, Inc.
Piirainen-Marsh, A., & Tainio, L. (2009). Other-repetition as a resource for participation in the activity of playing a video game. Modern Language Journal, 93, 153–169. Shaffer, D.W. (2006). How computer games help children learn. New York, NY: Palgrave Macmillan. Squire, K.D. (2006). From content to context: Video games as designed experiences. Educational Researcher, 35(8), 19-29. Zheng, D., Young, M. F., Brewer, R. B., & Wagner, M. (2009). Attitude and self-efficacy change: English language learning in virtual worlds. CALICO Journal, 27, 205-231. Games on consoles such as PS2, Gamecube, and the Dreamcast use memory cards (not internal storage) to save games. Library administration must either manage the students’ save files, or warn students that their games may be deleted/overwritten by other students. Students should be encouraged to use their own memory cards in a Library. Games on portable consoles (PSP, Nintendo DS) save games directly to the cartridge, and often allow only a few save files at a time. Students should be aware that other students may play their saved game, or delete the saved game to start a new game. Handheld-based games might be loaned out to a student (or reserved in the Library) for a few weeks in order for students to continue their games. Some games have lengthy unskippable unpausable cinematic scenes, and these can be frustrating to a student if he just wants to “jump in” and play the game. 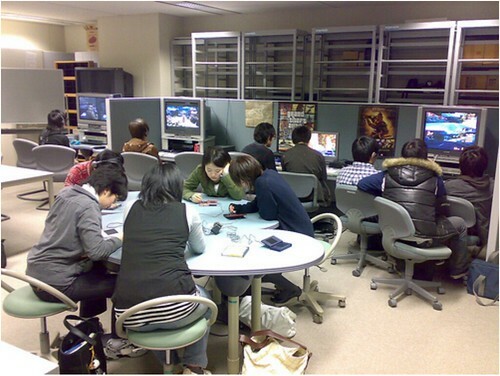 Some games and some systems do not allow multiple players, so if there are many students in the Library, not everyone can play a game. Some students sometimes have to be turned away creating a poor impression of the Library and resources. Equipment could be reserved if large numbers of students want to play (if additional equipment cannot be purchased). Older models of PC often cannot play newer games because of memory or graphics card limitations. Newer models of PCs should be purchased or games should be carefully selected to ensure that they will run smoothly on the computers. PC games cannot usually be installed to more than one PC at a time, and this can be frustrating if the computer a student used previously is not available when she returns to continue her game. Save files can also be difficult to move to another PC. A reservation system might prevent inconvenience. A game library can get very noisy at times. Headphones (with splitters for multiple players) are very useful. A voice volume policy can be enforced. Some students had difficulty reading English-only signs and materials, so these were translated into Japanese so both languages were presented. Students checked out and checked in their games by themselves, and the games were kept in the original boxes on a shelf. No thefts or damage occurred. If misuse or theft are issues, the games could be kept in sleeves in a lockable cabinet (if staff are available to manage this process). Flyers, signs, and a N64 game station playing Super Smash Bros outside the Library worked well to attract students. Choose a language learning focus (e.g., verbs, computer science, listening skills, games for children, …). Collect 3 games of any type with this focus and evaluate each one. Play one game for several weeks, several times a week. Write a Game Diary each time you play the game. Write a summary of your experience at the end of the semester (e.g., language learned, opinions of the game). Play one game until you have a good sense of its strengths and weaknesses. Write a review of the game itself (not focusing on its language). Examples can be found at www.1up.com and www.gamespot.com. In your review, include all of the points covered by professional game journalists (e.g., graphics, story, controls, value, overall score, …). Become a member of an English-language video game website (e.g., http://boards.1up.com/ or www.gamespot.com forums). Read and write messages about games. Keep a record of (1) your posts and (2) responses to your posts. Write a summary of your experience at the end of the semester (e.g., difficulty communicating with native speakers, things you learned, advice for other non-native speaker forum users). Read a guide/walkthrough/FAQ for your favorite game at www.gamefaqs.com . Carefully examine the format of the walkthrough. Play a new game, take notes (record) your play, then write a detailed walkthrough of a specific part of the game. You can write a guide/walkthrough/FAQ for any type of game (e.g., video game, card game, board game). Choose a game in one language (e.g., English or Japanese) and translate the language of the game (e.g., menus, dialog, commands, story) into another language (e.g., from Japanese to English, or from English to Japanese). Keep notes about new language you learn in the process. Watch several machinima (http://www.machinima.com/, http://www.mprem.com/, http://www.machinima.org.uk/, http://www.sims99.com/ ). Which machinima do you like, and why? Use machinima tools (e.g., The Movies, FRAPPS + Windows Movie Maker/iMovie) to create a short machinima piece. Study how a person (or a group of players) plays a game in another language. Find another student(s) to help you. Have them play a new game in another language. Watch and record the gameplay and interview the player(s). How did the student(s) play the game, what language did the player(s) learn/practice, and how did the game help/hinder language learning? Write a short research paper. Study the kind of language in games. Play one or several games and keep notes (record your gameplay). What are the frequent/typical/common/uncommon/unusual/interesting words, expressions, grammar and uses of language in the game(s)? Choose an topic you are interested in (a topic that might also be interesting to another person). Visit an English- language virtual world (e.g., World of Warcraft, Sims Online, Second Life) and carefully meet and interview the person about your topic. Write a short report of your experience (the person’s responses, what you learned, how you felt about the experience, and any language successes/problems in your experience online). Read several fanfiction stories (http://www.fanfiction.net/game/, http://www.gamertales.com/ ). Which fanfiction do you like, and why? Choose a favorite game and write a short fanfiction story. Use the vocabulary worksheets to study vocabulary in video games. Choose a language focus (e.g., vocabulary items, grammar point, skill work). Choose an appropriate game media/technology (e.g., video game, roleplay, board game) and create a game to teach the language focus. You cannot create a trivia, quiz, or matching game. Your game must be somewhat unique. You must have a fully developed game that can be played by other students. Choose a language focus (e.g., vocabulary items, grammar point, skill work). Choose an appropriate game media/technology (e.g., video game, roleplay, board game) and write a document describing the game design. You cannot create a trivia, quiz, or matching game. Your game must be somewhat unique. This project is appropriate if your idea is too technical or complicated to design in one semester. It may be possible to change commercial games to make them more useful for language learners (e.g., http://lingualgamers.com/thesis/ Choose a game (e.g., video game, board game) and make the game better for a language learner. Write a short report describing your changes. Teachers sometimes use games in the language classroom. Meet and interview a teacher about if/how he/she uses games in the classroom. Write a short report summarizing the results of your interview – what did you learn? Find a friend or family member that wants to study English. Choose an English-language game (e.g., video game, board game) and teach the person how to play the game (in English). Video tape your instruction and the subsequent gameplay. Evaluate your language use (i.e., was your language effective in teaching the game – did the player understand how to play the game?). Did the player learn English with the game? Find a school or community center that will let you teach the students. Choose a language point, and choose a game that will teach the language point. Make a lesson plan, teach the game (video record the class), and evaluate your instruction and the students learning of the language point with the game. (You could also assist a teacher with game-based language instruction in this project). In this project, you will only prepare to teach using a game. Choose a language point, and choose a game that will teach the language point. Make a lesson plan (e.g., objectives, activities, worksheets, test). Choose a teaching focus (e.g., verbs, computer science, listening skills, games for children, …). Collect 3 games of any type and evaluate each one – is it a good game? – can teachers use it effectively in the classroom? Use the Game Critique Guide to evaluate each game. Choose a language focus (e.g., a particular word, a grammar point, a skill). Choose several types of games (e.g., video game, board game, conversation game, virtual world, roleplay) and compare how each type of game teaches/practices the language focus (the content should be the same; the method/media should be different). Which is the most effective, and why? 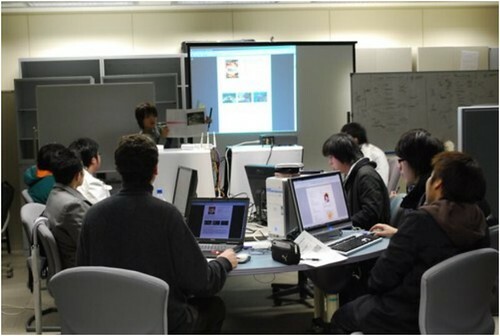 The Game Terakoya project is attempting to have students examine the sociocultural aspects of games and language. To help students, I put together a worksheet, which I will share here. Anyone should be able to comment on that document. I’d love to learn what could be altered in that document to make it more helpful to students. My students seem to be doing very well using the worksheet. Neither of them have ever analyzed text in this manner before, and the worksheet is helping them to look past just looking up words or expressions to thinking much more about the writer, reader, purpose, meanings of various texts. We have been using it with mostly written text at this point, but I have shown other media (e.g., President Obama’s “Yes We Can” ads) to illustrate how the questions can be used with other media. Putting together that document was a significant learning process for me. It’s helping me change my practice as well. The Game Terakoya is an extracurricular project that aims to help students interested in games and language transform those interests into public or professional participation. I have run a lot of projects with students (e.g., volunteer teaching, designing games, playtesting games for designers) but have found it hard to “measure” or contextualize the activity and development of my students. The multiliteracies (New London Group) and learning by design (Cope and Kalantzis) frameworks were shared with me a few years ago, and I found them fascinating and something I wanted to put into practice. 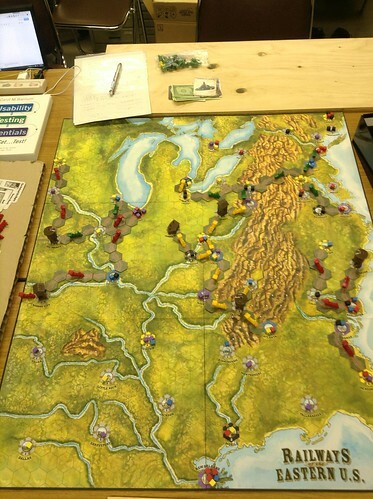 I wanted to “expand my repertoire” of teaching, and get students to do more conceptualizing and analysis around games. I wanted a way to tie together game literacy, project based learning, 21st Century skills, participation in society activities. 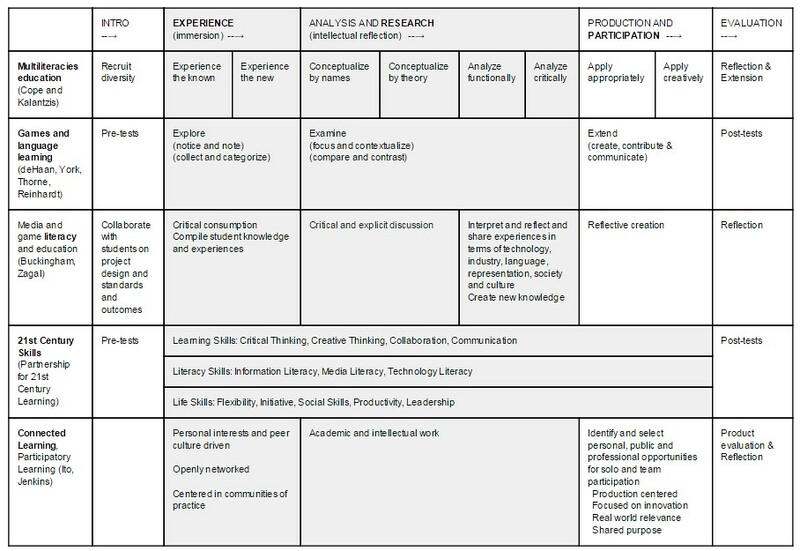 I’ve been working lately to write about the connections between multiliteracies/learning by design, media education, bridging and connected learning (Buckingham, Thorne, Reinhardt, Ito, Jenkins). “Terakoya (寺子屋 terako-ya?, literally temple schools, private elementary schools) were private educational institutions that taught writing and reading to the children of Japanese commoners during the Edo period. (wikipedia). The model that I am testing this year is represented in the following chart. It’s my general blueprint for moves up down left and right. Part of the research I’m doing this year is to see how feasible all these moves are. Ultimately, I would like to make these pedagogical moves more explicit parts of other teaching that I do. I’m currently working with 2 highly motivated university undergraduate students (“M” and “N”) and am testing out various exercises and materials with them. They want to improve their English skills and learn more about games, and have fun. Sounds great to me! We meet every Friday afternoon for 90 minutes. They are busy, but they can complete some homework each week. This is an extracurricular project, so I am trying not to overload them. We brainstormed participation options (to set a kind of roadmap for the project – something to aim for). They are interested in teaching using games, joining a gamejam, making a social impact game, teaching at our local kids center, writing online game reviews, making a game for a company and interviewing game designers… lots of great possibilities! We played UNO and examined our own language. Our discussions brought us to discussing “house rules” and “cheating” and “licensing” and “the magic circle” concept in game studies. I plan to come back to them in a few weeks, depending on how future games and discussions go. Our discussions start with M and N’s notes, then move into my focusing them on things they didn’t point out. We then moved to looking at some online reviews of UNO, on Boardgamegeek.com – a hobbyist site, and Amazon.com – a consumer site: https://boardgamegeek.com/thread/1366371/game-deep-strategy https://boardgamegeek.com/thread/312340/game-kids-not-geeks https://www.amazon.com/Mattel-42003-Uno-Card-Game/dp/B00004TZY8 What was fascinating was that the students read the first review completely at face value. They didn’t realize that the review was written sarcastically, even though they pointed out the adjectives and dramatic writing. In fact, one member said she changed her views about UNO after reading the article (she began to think of UNO as a deep strategy game). I’ve given them some info about English sarcasm and we will re-analyze it next week. It’s very interesting to me that I had to explicitly tell them that it was sarcastic (they reported to me afterwards that they knew what sarcasm was and how it was used). This coming week, we will be looking at a variety of new games for us to repeat the exercises in #3,5,6,7 with, then move into more conceptualizing, analyzing, then participating (they are intrigued with the idea of writing a sarcastic review as a participation option). It’s been an incredible process and project so far. I will try to blog each week with shorter updates.